Soils of the southern steppes, semi-deserts, and deserts constitute a group of arid soils. The autonomous soils of this group include calcic chernozems, chestnut soils, and calcisols. Solonchaks and solonetz are heteronomic soils. The steppes of Northern Eurasia occupy vast areas. They include forest-steppes with automorphic chernozems (luvic, leached, and typical), typical steppes with common and southern chernozems, and southern steppes with chestnut soils. Meadow chernozems and meadow chestnut soils cover considerable areas among heteronomous soils. Chernozems are the most fertile and therefore the most used soils. They represent about half of all the agricultural soils of Northern Eurasia and are used for growing grain, oil-bearing plants, and fruit crops. The best pastures are also supported by chernozems. 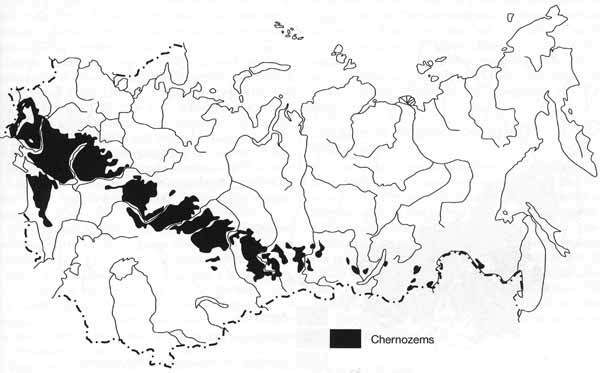 Chernozems occupy about 1.9 million km2 or 8.6 per cent of the total area of the FSU (Krupenikov, 1967; Rozov, 1968; Chernozemy SSSR, 1974; Simakova et al, 1996). They extend from the Danube delta to the southern Altay and occur locally in the intermontane depressions of the Greater Khingan mountains (Figure 4.4). Chernozems develop on lowlands or rolling plains with loess and loess-like loams and seldom on clays. Parent rocks usually contain carbonates and, in Western Siberia and Kazakhstan, easily soluble salts. Calcic chernozems are formed on carbonate loess-like loams (Figure 4.1). They exhibit the most typical features of chernozem formation, such as intensive humus accumulation, limited carbonate leaching, absence of eluvial-illuvial differentiation of the soil profile by clay fraction, iron and aluminium, complete saturation by bases, and a weak alkaline reaction of the soil solution (Plate 4.2). Chernozems have a high CEC, especially in the humic horizon, reaching 50 milli equivalents for 100 g soil. Calcium is dominant among the absorbed bases. In the chernozem zone, meadow chernozems develop in poorly drained localities, such as the lower parts of slopes, depressions, and ravines. They also develop under conditions of moisture surplus in northern steppes and deciduous forests. Meadow chernozems are very similar to chernozems in their morphology, but are distinguished by their darker colour and prolixity of humic horizon, increased humus contents, and presence of gley in the lower horizons. Chestnut soils occupy 107 million hectares or 4.8 per cent of the total area of the FSU and support grain crops (Rozov, 1968; Simakova et al., 1996). They develop on lowlands, rolling plains, and hilly terrain in Kazakhstan (Figure 4.5). Soil-forming deposits are represented by carbonaceous loess-like loams, loess, salted loams, and clays and by weathering products of sandstones, limestones, and mergels. The profile of chestnut soil is not differentiated by clay fraction, silica acid, and sesquioxides contents. These soils always have carbonates immediately beneath the humic horizon. They often accumulate gypsum and easily soluble salts at a depth of 1.0-1.5 m. The soil-absorbing complex is saturated by calcium and magnesium cations, and their reaction is neutral or weakly alkaline across the profile. In river valleys and terraces and intermountain depressions, where moisture is abundant and vegetation is represented by herbs and grasses, meadow chestnut soils develop. These soils have a thicker humic horizon and increased humus contents in comparison with the automorphous chestnut soils. These are one of the best agricultural soils in the chestnut soil zone. Solonetz, which are representative of the heteronomic group, are saline soils containing easily soluble salts harmful to plants. Salts occur at a depth of 20-50 cm and contain a considerable amount of exchangeable sodium in the soil absorption complex (Kovda, 1946, 1947; Zasolennye, 1973; Pankova and Novikova, 1996). They develop in topographic lows, such as depressions on floodplains and interhill valleys, under conditions of increased surface moisture supply or the presence of ground water with various degrees of mineralization. A solonetz profile is differentiated by its eluvial-illuvial type. Sodium constitutes over 15 per cent of the total exchangeable cations in the illuvial horizon and easily soluble salts (sulphates, chlorides, gypsum, and carbonates) are concentrated in the lower part of the profile. The horizon, which develops above the solonetz horizon, is enriched by silica acid and is poor in sesquioxides and clay fraction in comparison with the underlying horizons. The reaction of the soil solution is alkaline in the lower part of the profile. Physical properties are poor because of the high density and columnar structure of the illuvial horizon. Semi-deserts and deserts occupy about 8 per cent of the FSU area, stretching from the Caspian lowland to the Mongolian border (Lobova, 1960). The texture of parent materials and the concentration of salts vary. Loess-like loams, salinized alluvial-lacustrine deposits, older alluvial sand, and sandy-clay sediments occur on the flat Caspian lowland. In the southern Urals, which has dissected and hilly terrain, parent rocks are limestones and clay schists while in the Kazakh Knolls the parent material is loess-like carbonate loams and salinized Tertiary rocks. On the Turgai upland, salinized heavy loams are intermingled with sandy deposits. In deserts, parent rocks are older alluvial sandy deposits and in the piedmonts desert-steppe loesses and loess-like loams, often underlain by gravels, dominate. Alluvial loams and clays with gravel inclusions often occur there. Soils of the arid zone can be defined as mostly accumulative, saturated, neutral-alkaline, siallitic, carbonate, and/or salt xeromorphic soils. Brown semi-desert soils (calcisols) and meadow brown soils dominate in the desert-steppe zone, which covers about 2 per cent of the total soil area of the FSU (Figures 4.1 and 4.5). They have some natural fertility but arable agriculture requires irrigation. In deserts, grey-brown desert soils and takyrs (the clayey lands which are flooded in spring and dry out and crack into polygonal sections in summer) dominate and occupy 6.3 per cent of the total area (Figures 4.1 and 4.5). They have low natural fertility and mainly support pasture. 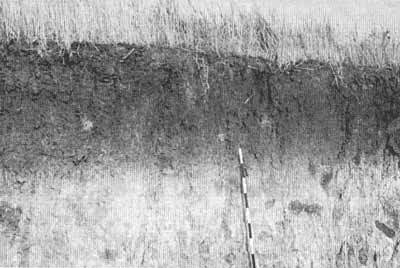 The principal feature of calcisols is their low humus content and the small thickness of their humic horizon (Lobova, 1960). Typical is the formation of the solonetz horizon. The A horizon is poor in clay fraction, iron, and aluminium but is relatively enriched by silica. Soils are mostly carbonate-enriched. However, they do not necessarily contain gypsum and easily soluble salts in the lower part of the profile. Calcium and magnesium are dominant among the exchangeable bases and the sodium content varies between 1 per cent and 14 per cent of the absorption capacity. 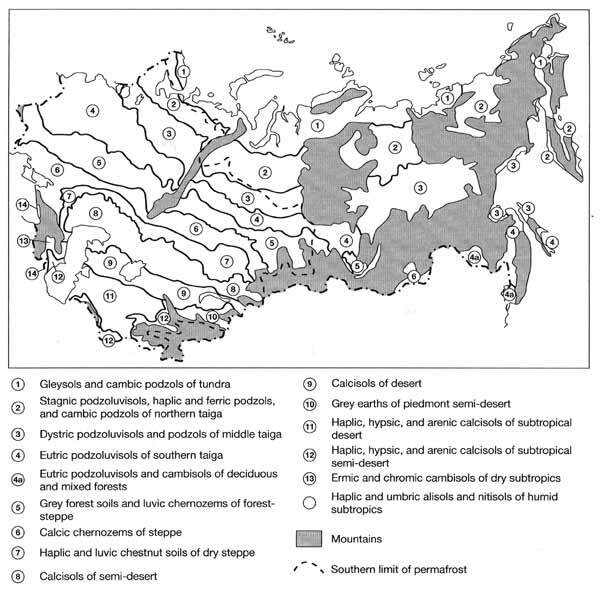 Vast areas are occupied by sandy deserts: the sandy Karakum and Kyzylkum deserts cover 55 million hectares (Lobova, 1960). Soils termed 'arenosols' represent mainly wind-redeposited sands or older alluvial deposits (Figure 4.5). Takyrs are the soils of clay deserts. They are distributed in present river deltas, older channels, piedmont plains, and intermontane depressions. These soils develop where there is permanent water stagnation in endoreic depressions composed of loams and clays. As a result of such conditions, salinization and desalinization processes have taken part intermittently in the formation of the soil profiles. 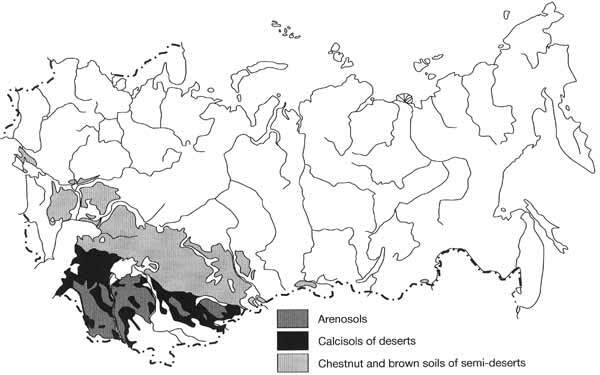 Solonchaks are salinized soils in which easily soluble soils develop on the surface, forming crusts or puffy horizons (Kovda, 1946, 1947; Zasolennye, 1974; Pankova and Novikova, 1996). Solonchaks are formed when highly mineralized ground and soil waters occur close to the surface at a depth of 0.5-3.0 m. They are usually associated with swamp margins and salt lakes, the bottoms of dry lakes, and higher terraces. Solonchaks occur mainly in deserts where they occupy about 10 per cent of the area. Apart from high salt contents near the surface, the presence of gypsum and carbonates in the profile is typical of solonchaks. The profile is distinguished by an absence of differentiation in the contents of oxides and silicic acid, by grain-size distribution and mineral counts. The chemical and physical properties of solonchaks depend on their salt chemistry (chloride, chloride-sulphate, sulphate-chloride, and sulphate-sodium). Sodium solonchaks are characterized by the poorest properties because the alkaline reaction causes the peptization of colloids and compacting of the soil mass. The piedmont desert and steppes in Central Asia and Transcaucasia accommodate grey earths. The total area occupied by grey earths, meadow grey earths, and meadow soils of the region is 33 million hectares or 1.5 per cent of the total area of the FSU (Rozov, 1968). In the mountains of Tien-Shan, Pamir, and Kopetdagh, the grey earth zone is the lowest altitudinal belt. The typical parent rocks are loesses and loess-like loams often underlain by gravels. Grey earths have a low humus content (1-4 per cent) and are rich in carbonate. They do not contain any appreciable amounts of easily soluble salts and gypsum.